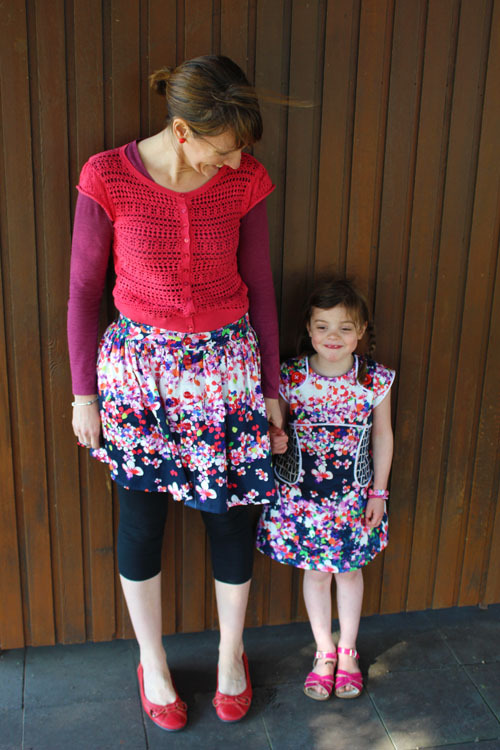 la maison victor - part two...an unintentional mini Dalores skirt! Hello! So this is post number two for the La Maison Victor blog tour. You can read all the details about La Maison Victor in my previous post here. 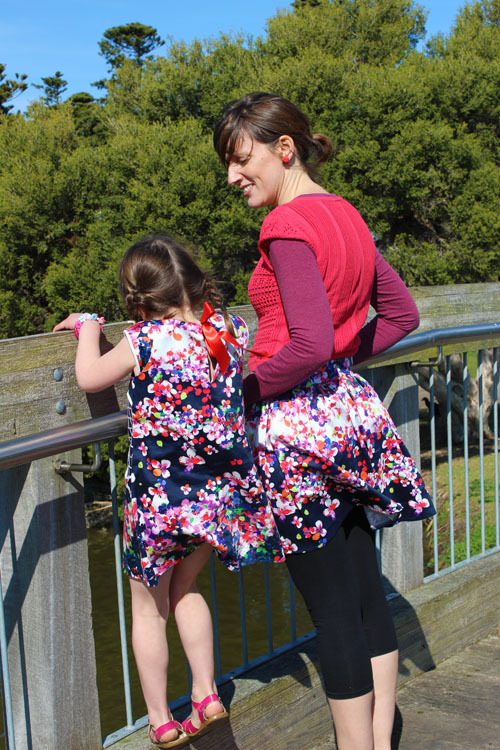 For this post, I am sharing the first Dalores skirt I made (which ended up just a little on the short side), along with a Miss Polly dress I made for Emily so we could twin! As outlined in my previous post, I hadn't realised until after the fact, that the Dalores pattern uses two pattern sheets to achieve the length, so this skirt is the shortest length outlined in the pattern , but is still 20 cm shorter than intended...Oops! Anyway, I still like it and will wear it lots! I bought this navy floral cotton sateen from Spotlight a couple of months ago and was excited to have enough fabric to make two garments. 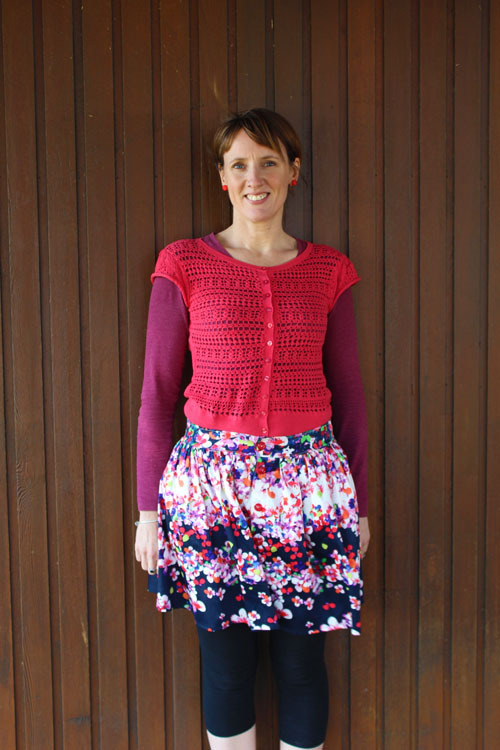 So although this skirt is short I have already worn it twice since finishing it on Saturday, which is a great sign! Since I cut the skirt too short, I had enough left over fabric to make something for Emily (every cloud has a silver lining, right?) 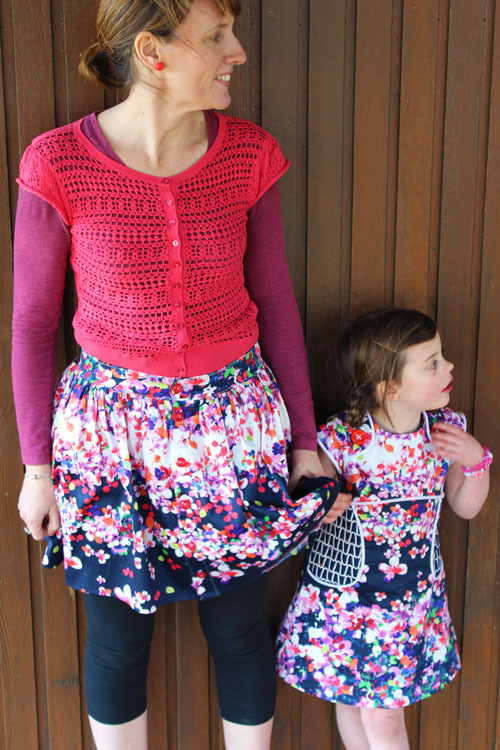 I went for a Miss Polly dress as it's been a while since I made one and I really still love sewing them up! I found a great contrasting fabric in my stash (also from Spotlight) and accented the dress with white piping and a red ribbon tie at the back. 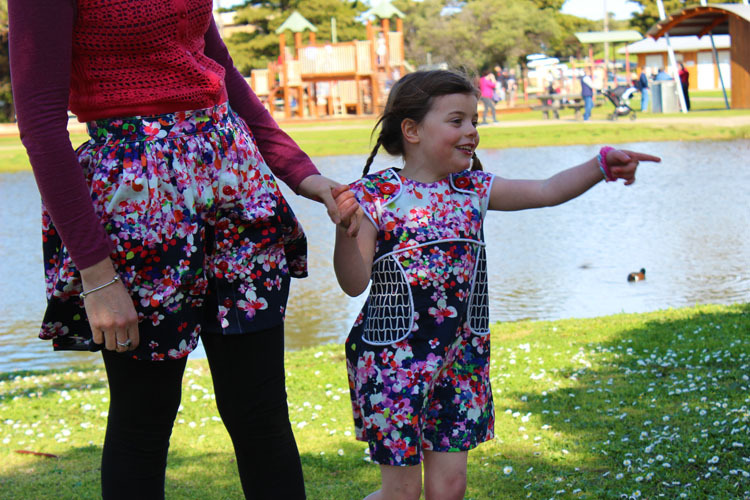 My sister took these photos for me down at a fabulous playground here in Warrnambool. Anyone with kids who has visited my town has been here I am sure! We have had really terrible weather in southern Victoria over the past fortnight - with heavy rain every day. This past weekend was a very welcome break from the rain and we were loving soaking up some sun at a family part. Emily was very excited to be playing with her cousins so was a bit tricky to pin down for some photos - but she did well and knows how to play the game! 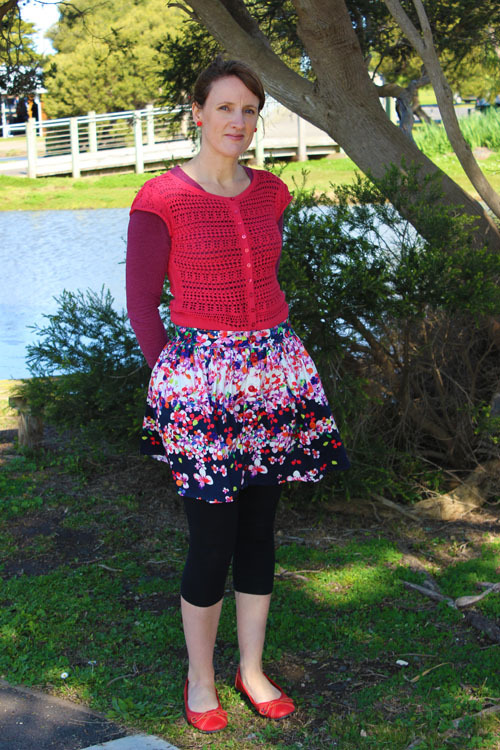 I am really pleased with my first Dalores skirt, even though it is short! Who knows, maybe I will even wear it without leggings when my legs have seen some sun this summer!!! Thank you Isabelle and La Maison Victor again for having me on this tour! It has been great! oh you ladies look so sweet together! Love Emily's new Miss Polly. Such great fabrics combo. Your skirt looks lovely, too. Twinning is winning! 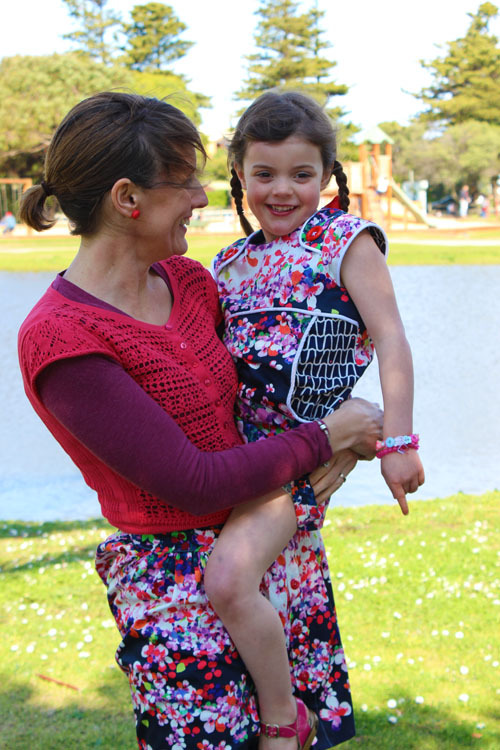 Love that fabric and you both look great in your new garments!